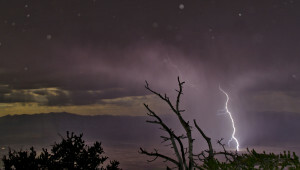 This image of a lighting strike near our field stations in Spring Valley, Nevada was captured by my assistant Jehren (https://www.flickr.com/photos/jehren/) during a maintenance trip. Not all lighting hits the upper elevations, just most of it. 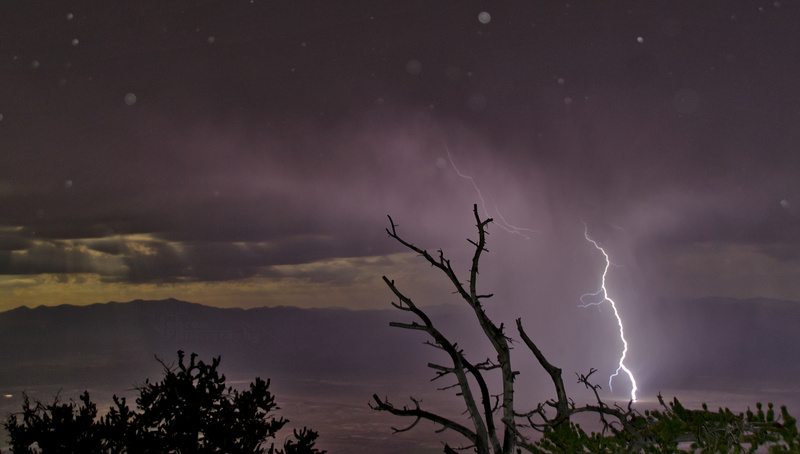 In the last post, I introduced lightning as a significant hazard to field science gear. In case you were thinking that my concern is hypothetical, I’m going to provide some real examples of what happens when waaaay too much static electricity gets close to your equipment. First up is a relatively tame example: on a set of field stations that were distributed across the elevational gradient on an 11,600 ft mountain, we originally installed DC/DC regulators that were designed to provide clean and stable voltage to a variety of electronics such as cameras, data loggers, radios, and networking devices. These regulators were specified to take a range of DC input voltages from our large solar arrays (48 or 24 volts, depending on the site) and output stable 13.8 VDC for the production equipment. The very first summer, we had 2-3 weeks of substantial monsoonal activity. We had 6 stations at lower elevations which experienced no problems whatsoever, and 3 stations at upper forested elevations which experienced power failures. Fortunately, we were still building out the various systems and were able to respond and diagnose the problems almost immediately. What I discovered was that, while none of the stations had experienced a direct strike (that I could detect), the 3 DC convertors at upper elevations were damaged during lightning storms. Given that in eastern Nevada, lightning strike density is strongly correlated with upper elevations, I could only conclude that near-miss EMP’s had killed the convertors. Those particular devices clearly have a circuitry weakness that none of the other field electronics have displayed yet. I’ve still got a couple of the convertors running at lower elevation 5 years later, mostly as an experiment, and they have been fine. Another lesson in linear hardware dependencies……. 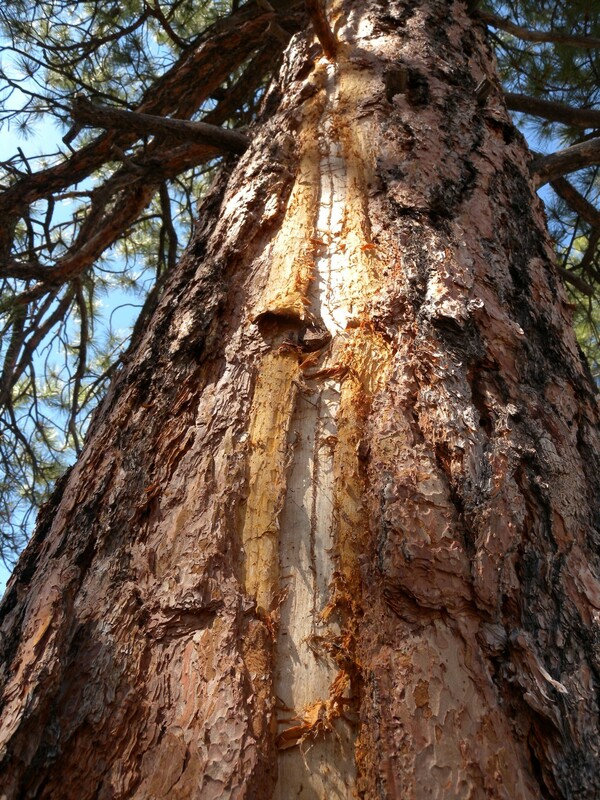 This fresh lightning scar on a ponderosa pine is evidence of the destructive power of high voltage. Because this happened in the middle of a multi-year drought, the trauma suffered by the tree proved to be too much, and the tree died during the following dry season. Next up, and for more interesting, is an example of a direct hit on a station. Down south near Las Vegas, Nevada, I maintain some climate stations that are also distributed in elevation. One of them is located in a ponderosa/pinyon pine/juniper woodland. In addition to monitoring climate, we are also studying the trees and their growth responses. This means that there are sensors distributed to several trees around the site, with wires running back to the dataloggers on the station itself. 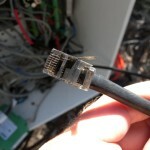 All told, there are hundreds meters of wiring distributed across the site. As can be imagined, this is sort of “asking for it” in monsoon country like Las Vegas, especially given that some of the old-growth trees in the area showed evidence of multiple lightning hits. But, science must proceed! Sure enough, the second summer after the installation we had some decent storms, with some dropping close to 50 mm of rain in a day. With these intense convective storms comes lightning. It was during one of these events that the forested station disappeared from the network: it was “off the air”. 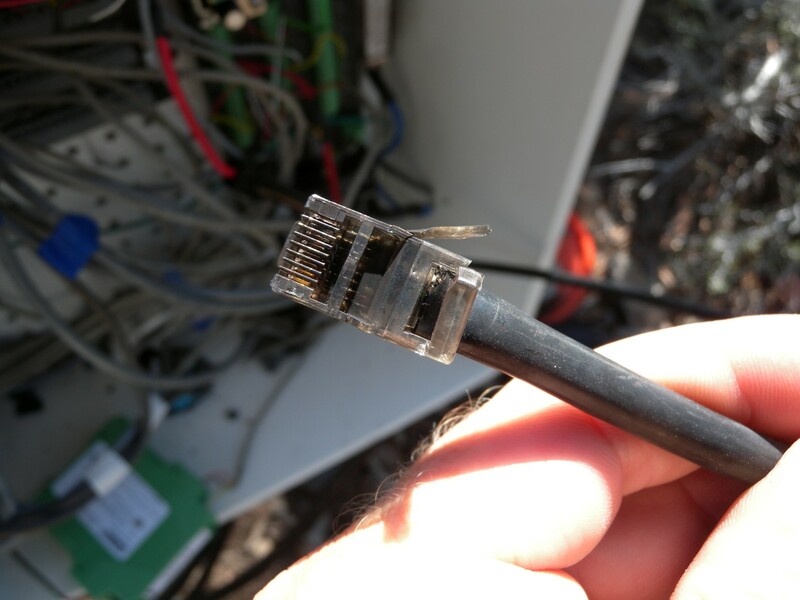 A voltage surge from the lightning hit made it into one of the ethernet lines, where it was stopped at a grounded surge protector. At the next opportunity, some 2 weeks later, I made a trip into the site to evaluate what happened. 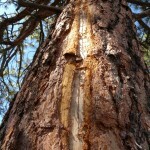 I found one of the large, mature ponderosa trees with a fresh lightning scar running from the crown to the base. A good amount of bark had been blown off the side of the tree, and worse, where the scar passed by our sensor wires it was pretty clear that the high-voltage electrical current had jumped into our system. 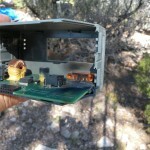 We lost the 3 sensors on the tree, the attached datalogger, an ethernet switch, and the system camera. Several other sensors on surrounding trees were damaged, but fortunately not the entire array. The other two datalogger systems on the station were fine, albeit with damage to one vibrating-wire sensor interface on our precipitation gage. The network radio had a built-in surge protector circuit pop, which required repair. 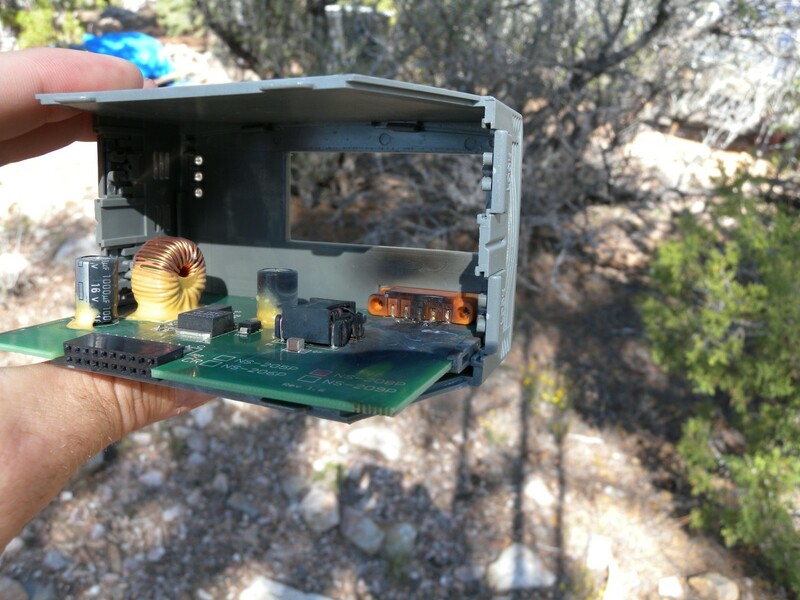 This ethernet switch was killed by voltage that made it out of the vegetation sensory system into the communications systems. Fortunately, ethernet surge protectors on other devices attached to this one functioned as designed and did not allow the transients to pass. In the end, in some cases it was very obvious how the voltage traveled around the wiring and arced into other circuits. However, there was also some unexplainable damage that must have been the result of transients as well. This particular site had distributed/interconnected grounding, but not a true “mesh” of copper across the area. During the rebuild, I took additional grounding and surge-protection precautions. Three years and several major storms later we have not had a repeat, but given the evidence on the landscape it is only a matter of time…until I get to write a follow-up post on the topic! Bottom line, it can definitely happen, and sometimes you just aren’t prepared enough. Sometimes there is nothing you can do, lightning rarely behaves nicely. Good design and field-tested components can save you extra expense and headache in the long run. So, good luck in your own installations, and if you have a similar experience or advice, post it up in a comment!